Takeaway: Boost the performance of your garden with the latest products available for modern growers, featuring items from Gorilla Grow Tent, MicrobeLife, Hydrofarm, Meigs Fertilizers, and Reiziger. These products are all #GoodtoGrow. All plants are alive with cells requiring life-supporting essential elements provided through photosynthesis and soil root transfer via biology, i.e., carbon cycle, nitrogen cycle, phosphorus cycle, and other critical reactions. Organic Photo Plus provides enhancements essential to plant growth and stability, and promote plant vigor. 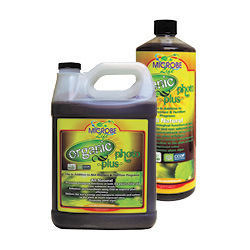 Organic Photo Plus enhances biological function at the foliar and root substrate levels, transporting the sun’s energy and speeding carbon to plants at much improved rates. The culture in this product is fermented over six days, resulting in an ecosystem in a bottle. This photosynthetic bacterial ecosystem is shelf-stable for two years. This same culture is used on tens of thousands of acres of food crops worldwide. The Phantom 50 Series DE 1,000W, 277V Commercial Lighting System is offered in both open and enclosed versions. At the heart of these systems is the Phantom Commercial DE Ballast with USB interface, which enables connection with the Autopilot PX1 Digital Lighting Controller. The ballast features six-way wattage output control: 600W; 750W; 825W; 1,000W; and 1,150W + PX1 control mode. 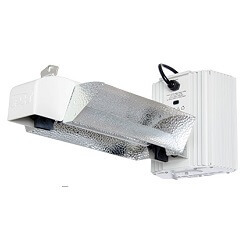 Each double-ended lighting system includes either an open or enclosed reflector design. The open version is best for broad light footprints, and the enclosed reflector brings a more focused light pattern. The reflectors feature compact designs and premium hammertone interiors. Rounding out the system is a premium European-made DE HPS lamp with a rated PAR output of 2,100 µmol/s. Meigs takes pride in its products and is proud to offer a wide array of all-natural and organic fertilizers and amendments. You do not have to use harsh chemicals to optimize your plants production; you need the right balance of nutrients working together, otherwise you jeopardize the quality and quantity of your harvest. Meigs offers plants all the nutrients they need during specific growing times throughout their lifecycle. 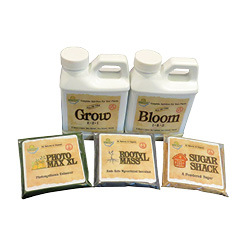 The liquid fertilizer kit includes base nutrients, Grow and Bloom; and additives, Sul-Cal-Mag, Big Tops (bloom booster), Bud Honey (carbohydrate), Mother’s Little Helper (stress reliever), Root Mass XL (myco powder), Sugar Shack (a powdered sugar), and Photo Max XL (photosynthesis enhancer). Meigs liquid fertilizer line does not have to be used all together. You will have great results using just the base Grow and Bloom, but using the line together will maximize your growing efforts and give you the best results. 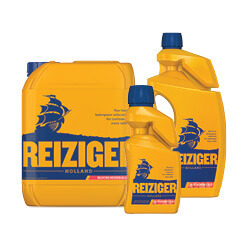 You can use any of the products in or with any other fertilizer brands. Gorilla Grow Tents, with their incredibly strong industrial zippers and nearly indestructible 1680D-thick fabric and all-steel interlocking frame, are by far the best option for those looking for an easy-up enclosure with all the features of a fully custom-built growroom. However, grow tents have always had the stigma of falling short when it comes to adding on the extra components that complete your growroom. Now, with the Gorilla Grow Tent Accessory Line, those concerns are a thing of the past. 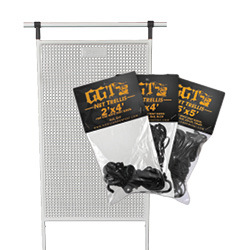 The GGT Gear Board allows growers to easily mount components like ballasts, wall fans, AC units, and more to the side of their tent, keeping these essential items from cluttering their grow space and placing them in a convenient, easy-to-reach area. The Gear Board is joined by the High CFM Kit, which keeps your inline fans from pulling in the walls of your tent, and the Net Trellis Adapter gives growers the perfect tool for controlling the growth of their plants. This ultra-potent elixir has been celebrated among Dutch craftsmen for decades thanks to its ability to deliver remarkable benefits. Reiziger Bloom Minerals is a luxurious formula that enriches blooms with the energy they need to thrive. Rich in pure, rapidly absorbable proprietary phosphorus and potassium minerals, you’ll instantly notice visible increases in size, weight, and quality. The formula will push your plants into generating an additional flowering phase, delivering quick harvest increases of up to 35 per cent in bloom size, weight, and quality. The formula can be used in every cultivation system in combination with every kind of feeding. This formula will delight even the most experienced craftsmen, as it essentially unlocks a new flower layer bursting with increased biomass that directly transform to increased potency, heavier harvests, and quick flowering, bud set, and formation.